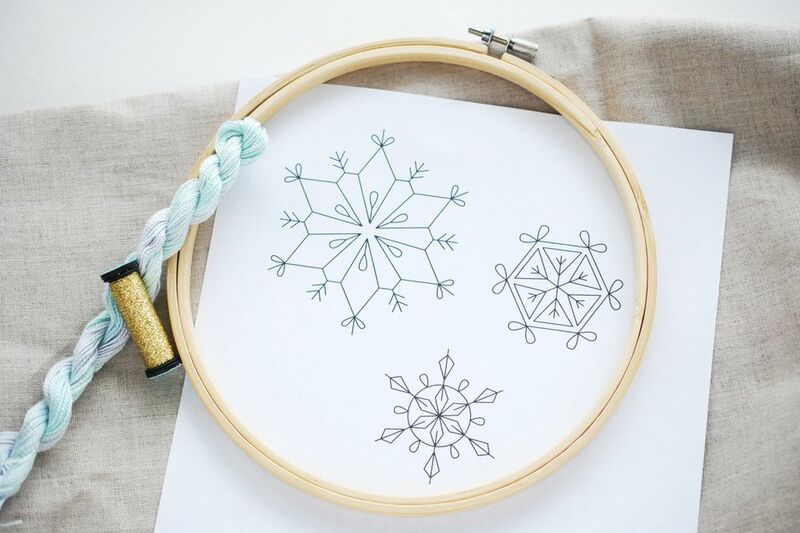 Get ready for winter with a mini collection of snowflake hand embroidery patterns. Just like real snow, you can stitch these free designs in lots of ways so that no two are alike. Beginners and more advanced stitchers will enjoy working on these patterns. While the snowflake motifs have lots of little lines and details, you can work them up with just a few simple stitches. Or use this as an opportunity to try out a few more essential embroidery stitches. Your finished snowflakes will shine! These three designs are a great place for you to start, but you can also adapt or adjust these to create your own personalized snowflakes. These may even inspire you to make your own simple snow patterns. Before long you'll find yourself stitching a snowstorm. Add these snowflakes to hats and scarves, embroider a winter table runner, or frame them in a hoop to add some snow to your walls! They also make great ornaments! For the full-size pattern that you can resize however you like, download the JPG file. Use the patterns together as a grouping, or separate them out. If you aren't using them in the given formation, you may even want to separate and resize them all to a similar proportion. Since snow is white, DMC Blanc embroidery floss is an obvious color choice, but light blue or even light gray are also good options. To make your snowflakes extra special, use metallic floss or add metallic blending filament to standard floss. When stitching with light colors it helps to stitch these on a darker background so they show up well, but even natural linen will work. To transfer a pattern onto dark fabric use water-soluble stabilizer. Use the tracing paper method if you are stitching on an item that would shrink in warm water. You can use any stitches you like. You can even embroider the same design with different stitches to change the look. To start out, try straight stitch and detached chain stitch for the arms. Use your favorite outlining stitch for the rest of the lines or try running stitch for a different look. To customize these patterns, switch out one shape or stitch for another. For example, in places that use a detached chain (lazy daisy), use a fly stitch instead. Or add in french knots at the ends of the straight stitch arms. Another way to customize your designs is to add a few beads or sequins as you stitch. To make your own snowflake patterns, mark out six branches radiating from the center. Start adding stitches and designs as you go, making sure that each branch of the snowflake matches. If you like planning things first, sketch your design and then transfer it. Or, use a water-soluble pen to mark the basic shape and then start stitching! Improvising your snowflakes is a great way to ensure that you are making something truly unique.